I made the cake layers into books! I read a lot, so I see books in everything I do. As a matter of fact, I saw a video of this month’s release, a little sneak peak, and as soon as I did I thought “Oh, books!”. Ha. Not to say that I don’t also enjoy cake, just to be honest. This card is very clean and simple, and I like it so very much. I chose four ink colors and stamped the images in a way that they look like they’re on a bookshelf. The last image I stamped in a leaning fashion, as if it were on a real bookshelf. To finish the card I stamped the sentiment and then used a stitched die around the border before adhering the panel to a card base. Good morning! Today is the 9th of the month which means we have a new release to drool over at Concord & 9th. And even better than that, it’s the day we celebrate three years of Concord & 9th awesomeness! Happy Birthday Dear Concord & 9th. I am so thankful that you have entered this craft industry with your innovative and creative products. To help celebrate this special day the design team from Where Creativity Meets C9 is helping Concord & 9th highlight their new sets this month. Each Friday we will be posting to show you the new goodies. First up is the Birthday Dies and Birthday Balloon stamp set. These are both part of the earned rewards program that Concord & 9th offers when you shop from their store. Customers that spend $60 or more in the shop will earn Birthday dies free. Customers that spend $120 or more in the shop will earn Birthday dies plus Birthday Balloons stamp set free. It’s a fun stamp set featuring this giant balloon and a couple of small images. 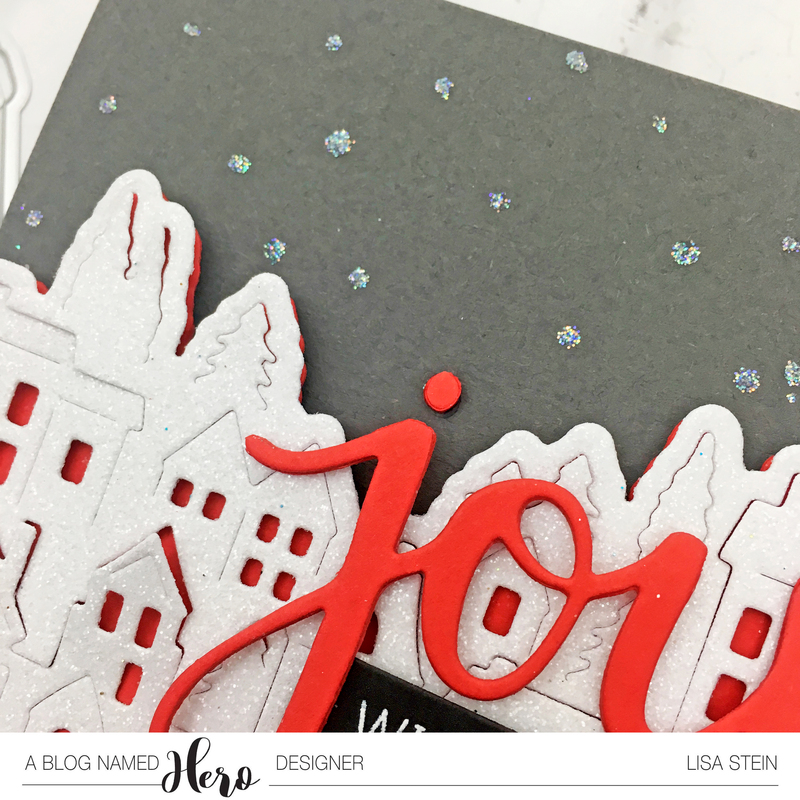 I used the star and confetti images to create a background using distress oxide inks. I wanted this to be bright and cheerful and applicable to anyone celebrating a birthday. I often find that I make very specific birthday cards, and I wanted one in my stash that I could use for anyone. I stamped the balloon and tie images onto cardstock with a mixture of Twisted Citron and Peeled Paint oxide inks. I knew I wasn’t going to get a perfect image, so I thought I could help that by mixing the colors. This way it sort of looks like a balloon when you hold it up to the light, how it’s more opaque in some places than others. 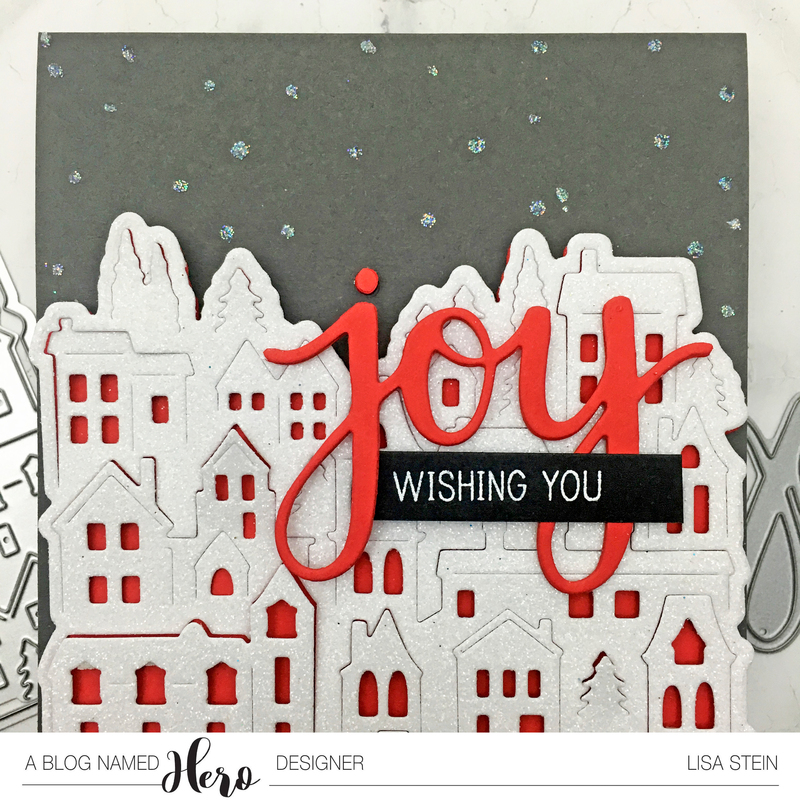 I heat embossed this with clear embossing powder to give it a bit of shine. I trimmed this by hand and adhered it with foam adhesive to the card front. I tied a bit of twine around the balloon tie first, just to make it easier for myself. I used the Birthday Dies with the Summer Glitter cardstock for the sentiment. That blue works well with the Salty Ocean oxide ink on the background. I adhered the “happy” onto the balloon and the “birthday” I put on a piece of black cardstock, to help it stand out a bit on the card. 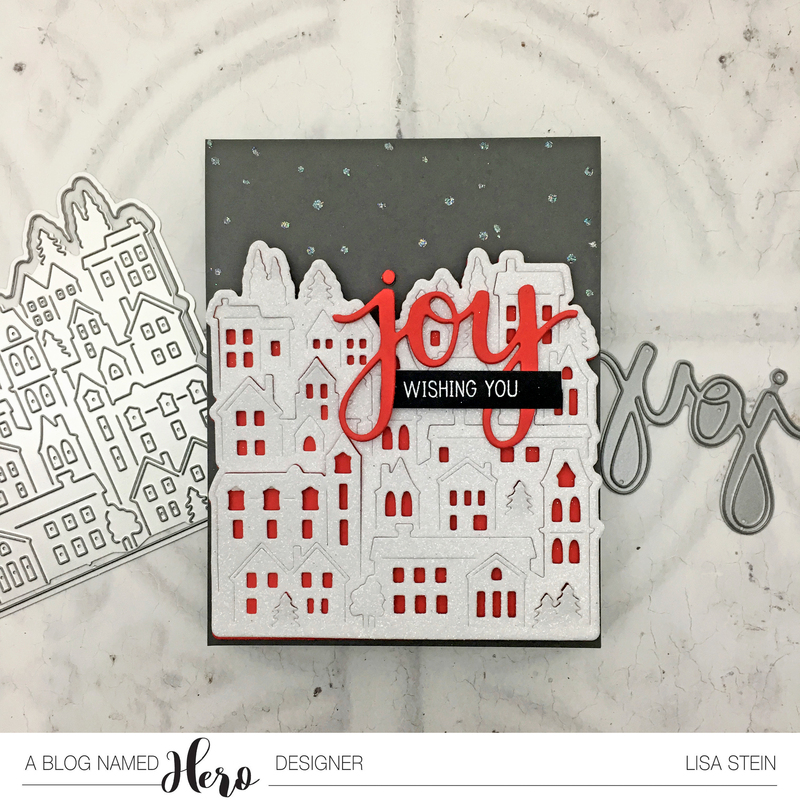 Our challenge this month at Where Creativity Meets C9 is one that I know you’re going to love. Anything Goes! As long as you use product(s) from Concord & 9th, you can enter. Make sure you read the Challenge Rules to qualify. Thank you so much for stopping by today, I’ll be back soon with more paper crafting! Good morning! Today is the last Feature Friday of July and we are showcasing the amazing and wonderful must have turnabout that came out this month. It’s called Lovely Blossoms and it’s spectacular. I love how you can change the look and feel of it just by switching colors. Warning you now, you’ll be seeing a lot of this stamp on my blog in the coming months. The coordinating die set features two hexagons, a sentiment, hearts and a flower shape. It will also get lots of use in my craft room. For this card I stamped the turnabout four times using different inks from Hero Arts. I made this with a particular friend in mind as these are the colors of the nursery for her upcoming baby. I’ve got yarn on order for a blanket, so I decided to make this card in advance. Ha, what a novel concept for me. Once I had the panel stamped I used the large hexagon die to cut this shape. I also used that die to cut the card base. To do that I had a folded card base and aligned the die at the folded edge, but just over it a wee bit, so it would leave the folded edge intact, thereby making a hexagon shaped card base. I adhered the stamped panel onto that, and then glued down my sentiment and banner. 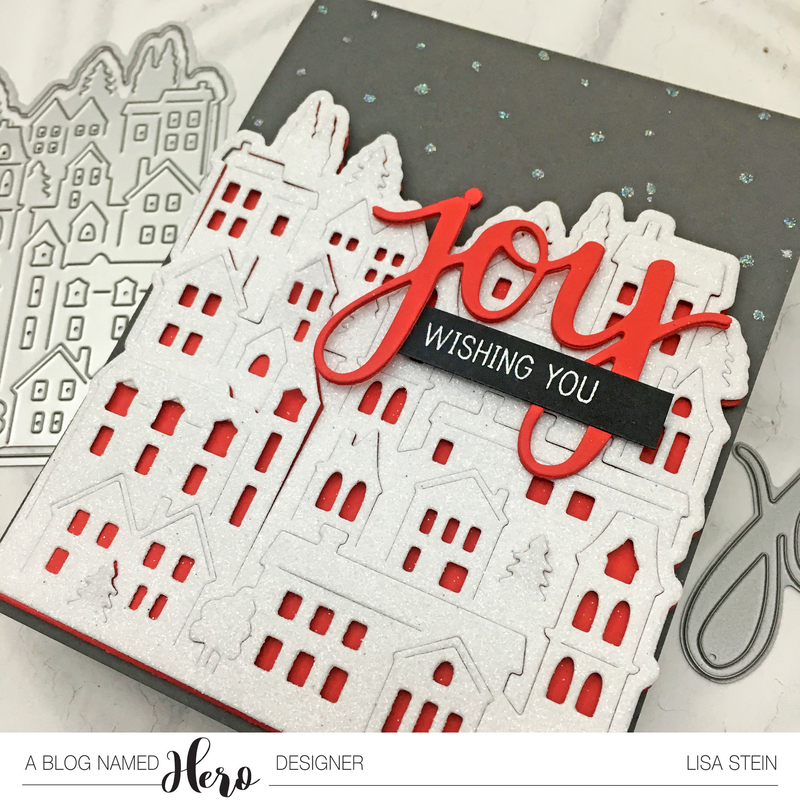 The “welcome” die comes from the City Stacks die set, and the “sweet baby” comes from the Laurel Frame stamp set. I die cut that sentiment four times and adhered them altogether to make a chunky word die. I used Copic markers to color it, and then clear heat embossed it a few times to darken the colors and to make it shiny. I do that quite a bit and it’s one of my favorite things to do. Something about the magic of embossing that will never bore me. Since I had some of that stamped panel leftover I had to use it, and thought this die from the Lovely Blossoms die set would look beautiful in that subtle pattern. To keep it simple, yet still allow it to shine, I used both hexagons from the same die set to create the vellum panel. I love those stitches in the hexagon! I adhered the die cut to the vellum using glossy accents, and also the negative space from the die cut, for alignment purposes. Once that dried I used thin strips of adhesive foam on the back of the letters to add this to another hexagon shaped card base. You can see that the vellum is sort of floating on the card base, as it isn’t completely adhered. I love it! A few sequins and we have a sweet little card to tuck in with a gift. I can see myself making hexagon shaped tags for the holidays. I need to file that idea away to use in a few months. Thank you so much for joining me this month for Feature Friday. I’m excited to announce that the entire Where Creativity Meets C9 design team will help celebrate Concord & 9th‘s third birthday in August by participating in Feature Fridays. Happy birthday sweet Concord & 9th! Good morning to you! Thank you so much for stopping by today. 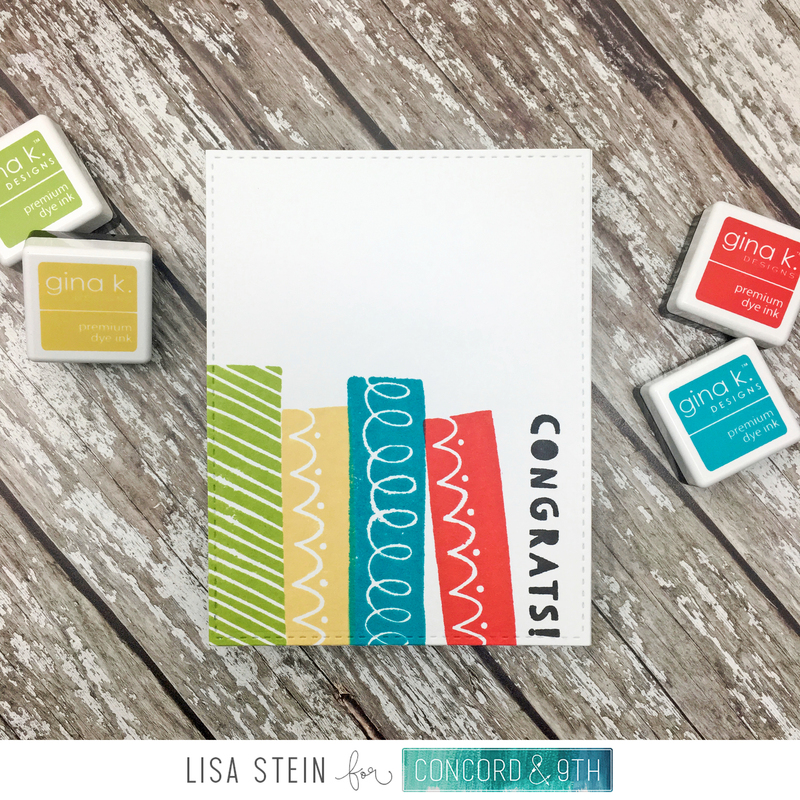 I am joining Concord & 9th for their Feature Friday and we’re all using the Triple-Step Thank You stamp set. And it is awesome! I’ve paired the stamp set with the new Dip-Dyed Cards & Envelopes and I’m somewhat in love with what I’ve made. This first card was made with Distress Oxide Fossilized Amber ink, which truly is a magnificent color. I simply adore it, and I’m not even a fan of yellows, ha. However, look at this gorgeous specimen! It worked perfectly with this card from the Dip-Dyed set, and I couldn’t be happier with it. For all of these cards I stamped the first image, which for me was the “T, o and k” image. I stamped this three times to get excellent coverage, then used clear embossing powder to emboss those letters. Next I stamped the “h n” image, again three times, then clear embossed. Finally I stamped the “y a u” image and clear embossed. That just seemed to work out best for me, but I advise you to play with these stamps to see what works for you. There is no wrong or right in stamping, only happy accidents! I stamped a few of the sentiments from the stamp set onto black card stock with versamark ink and white heat embossed. Once those were trimmed out I just mixed and matched until I liked the way they fit, visually, and popped those up on foam adhesive. This example features Evergreen Bough Distress Oxide ink, which is just the perfect shade of teal. I did the same steps here, and as you can see I switched up the sub sentiment. Oh, Abandoned Coral, you make me swoon. Thank you for matching this Dip-Dyed card perfectly. I chose to use the sentiment that had the word “heart” in it just because of the color scheme here, and thought it worked well on the bottom of the card. I did not having a matching Distress Oxide ink for this, but absolutely love navy and gold, so I used versamark ink and gold embossing powder. I thought this was simply elegant as it was, and did not use a sub sentiment on it. I can always add one later if I need to, and sometimes I like leaving my options open. I hope you enjoyed these cards and get inspired to make your own one layer card set. I’m thinking I might give these to my sister as a little gift, knowing that she can always use thank you cards. Today at Where Creativity Meets C9 I’m sharing details of this “Las Vegas Sunset” card. I hope you’ll come check it out. I’ve updated the *.pdf files for the new Ranger Distress Oxide Inks. Click here to go to the original post to snag your new pages. I’ve got a fun post over on the Hero Arts blog today featuring this card, and five more, ha! Please check it out.